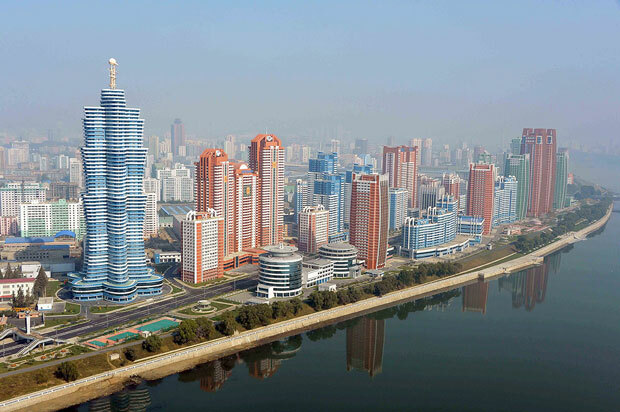 Like any national capital, Pyongyang is a dynamic and growing city whose fortunes rise and ebb as the fortunes of domestic and international affairs fluctuate. Pyongyang was founded in 1122 BC (according to legend) and served as one of the capitals of ancient Korean kingdoms. Over the course of the Korean War, the city - like much of the peninsula - was completely destroyed. Kim Il Sung spent enormous resources rebuilding the nation and redesigning Pyongyang into a showcase capital. The attempt to use the capital to project power and showcase the miracles of socialism resulted in massive 'people's palaces' and numerous monuments, and peaked with the construction of the Ryugyong Hotel. Construction of the hotel, which was to be the tallest hotel in the world, was halted in 1992 (it still sits unfinished to this day). The fall of the Communist Bloc between 1989-1991 and the following famine of 1994-1998 resulted in the near total collapse of the North Korean economy. Pyongyang itself suffered stagnation and large swathes of the city degraded. In the early 2000s, as gray and black markets began to rise, so too rose the fortunes of Pyongyang and the government has since embarked on a modernization program. The process was relatively slow under Kim Jong Il, but Kim Jong Un has overseen one of the largest building booms in North Korea's history. One good and simple measure of the growth and strength of a city is population, unfortunately, population statistics are considered a state secret in North Korea, so getting accurate figures can be difficult - especially when you consider the widely varying figures concerning the number of deaths during the famine and the fact that there have only been two national censuses since 1980. Fortunately, the use of satellite information can help fill in some of the gaps by showing which areas have undergone urban growth. Contrary to what one may expect, despite all of North Korea's economic problems and the vast sums spent on military projects, the change in Pyongyang over the past 30 years is pretty astounding. A resident from 30 years ago would scarcely recognize the Pyongyang of today. Thanks to Google Earth, historical Landsat and Copernicus satellite imagery dating as far back as 1984 is now easily available and covers most of the planet. Using this resource one can see the growth of cities and the spread of human development; an asset for studying a large number of topics. The outlines in the images below are densely populated urban areas that are contiguous within the outlined area. In other words, if there are two urban spaces separated by a large area of forest or farmland, they won't be included within the same outline. In 1984, Pyongyang had an urban area of approximately 70.2 square miles (+/- 1 sq. mi) and by 2017, Pyongyang's urban area had grown to 103 square miles (+/- 1.5 sq. mi). At this point it's important to make the distinction between the capital region of Pyongyang and the core city of Pyongyang proper. 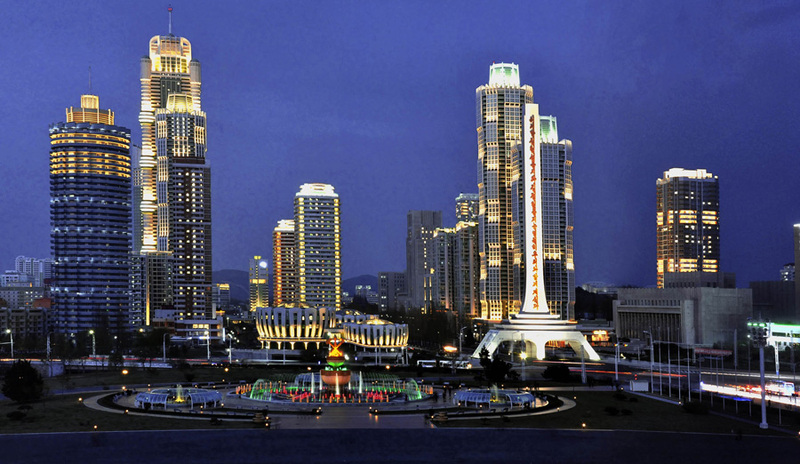 The Pyongyang region is 1,233 square miles and has a population of over 2.5 million. However, within the region are 19 wards and two counties, and within all of those are dozens of smaller towns and villages. One of the larger areas within the region is Kangdong, which has a population of 221,000 and is around 20 miles away from downtown Pyongyang. So when considering population and population density of Pyongyang proper, it's necessary to exclude the populations of these satellite areas. Here is a map showing the nine largest urban/industrial areas within the Pyongyang capital region as of 2017. Outside of the city of Pyongyang and the growth of the airport, little has changed in the expansion of other urban areas with the exception of the city of Sangwon, which largely grew up as the Sangwon mine was established and the cement complex opened (in 1989). To determine the land area of urban spaces, I outlined the areas and cut them into easily measurable geometric shapes. The white area is Pyongyang's main urban coverage in 1984, and the yellow represents 2017. It required over 200 individual measurements. You may find some areas that look like irregularities (yellow lines inside of white areas), and that's due to the fact that the image resolution for 1984 is much lower than that of 2017, making the 1984 area slightly less precise. I have tried to correct for this. Beyond the simple growth of urban boundaries, the density of buildings has also changed drastically, particularly in a few key areas of the city. The change in total area of Pyongyang from 70 to 103 square miles is a comparatively slow growth rate when you look at other major world cities. Even my own medium-sized town has doubled in land area over the last 30 years. One reason for this limited growth is, of course, that residency in the capital is tightly controlled and has tended to stay at 10% of the national population. Another reason is the fact that there is no private land or home ownership (officially), so there aren't the endless subdivisions of single-family houses as seen in the US and other countries. Pyongyang in 1984 showing some of the major areas of future construction. The Mansu Street area is already under development by this time. Image based on Google Earth and Landsat/Copernicus. Because of those facts, most residential units are in apartment complexes and single-story multi-family houses. There are three areas that really stand out to me as seeing the most growth and change over time: Ryomyong Street (which recently was 'opened'), Mirae Scientists Street, and the Tongil Street area which has been growing for the entire 30-year period. A quick comparison of satellite images from 1984 (above) and 2017 (below) clearly shows the expansion of these and other areas, but I will only go into detail for the three I mentioned. Pyongyang in 2017. You can see the large amount of development in the Tongil and Kwangbok regions as well as other changes such as the construction of the Ryungyong Hotel, the expansion of the Palace of the Sun, and the May Day Stadium which was built in 1989. Tongil Street is a major road that runs east to west on the southern side of the Taedong River. Planning for the construction of the street (and associated buildings) began in the early 1980s along with several other smaller "street projects" like An San Taek, Munsu, Kwangbok, and Yanggwang streets. However, Tongil didn't see much real construction until 1991 when a speed campaign turned the area from farmland into a booming work site. The Tongil Street area in 2017. As you can see in the 1984 image of Pyongyang, nothing existed in this area at the time. Since construction first began in the 1990s, Tongil Street has undergone almost continual growth. Other areas have also grown out from Tongil and now include the Pyongyang University of Science and Technology (PUST), Chollima Building Materials Factory, and the Pyongyang Catfish Farm. Google Earth image of Mirae Street on May 10, 2001. The next street is Mirae. Mirae runs along the northern bank of the Taedong River, across from Yanggak Island. "Mirae Scientists Street" was developed to house faculty and their families as well as various institutions of the Kim Chaek University of Technology. The development included over 2,500 apartments and boasts one of the tallest buildings in Pyongyang, the 53-story Mirae Unha Tower. However, many of the apartments on higher floors of the various buildings remain uninhabited due to a lack of electricity to power elevators and heating units, despite being completed in 2015. Additionally, the development came after a 23-story apartment building collapsed, killing dozens of people. These two factors have likely played a role in the slow pace of occupancy. This brings me to a larger issue that plagues North Korea. The country has relied on Stakhanovite mass-mobilization speed campaigns (like the Chollima Movement) to construct large projects at a neck-break pace. From hydroelectric dams to large buildings, the government forces their completion within a year or two at most (if they get their way) when in reality, these things should take upwards of 5 or 10 years to be done safely. While Pyongyang may now be bustling with rather striking looking and shiny new buildings, the soundness of their construction and long-term safety is deeply questioned. Google Earth image of Mirae Street on May 1, 2012. You can see some apartment buildings have been built since 2001. Modern Mirae Scientists Street, also nicknamed "Pyonghattan". The last major development I am going to focus on is Ryomyong Street, which was only opened in April 2017. Running roughly southwest to northeast, the street connects the 15 April House of Culture and the 92-meter (302 foot) tall Tower of Immortality with Kim Il Sung University and the enormous Palace of the Sun, which now serves as a billion dollar mausoleum for Kim Il Sung and Kim Jong Il's bodies. The new towers offer thousands of additional housing units. Kim Jong Un ordered the construction of the area's redevelopment in March 2016, meaning the multiple residential buildings (including one that has 70 floors), stores, and restaurants were all completed in less than 13 months - which again calls into question the quality and safety of the buildings. There is a second phase of the project, which is still ongoing, that is expanding Kim Il Sung University and constructing new housing further up the street. Funding for the "200 day speed battle" to build the area came (at least in part) from the government's demand that families hand over $50 to pay for it. While $50 may not sound like much to us in the West, it's enough to purchase 80 kg (176 pounds) of rice on the market. It's also the approximate equivalent of 2 weeks' pay. These funds are on top of a seemingly never-ending demand for "loyalty payments" and other fees citizens are required to regularly come up with. There has also been inevitable change to the more rural areas of Pyongyang. Multiple small villages have been demolished and rebuilt along more efficient lines. Not only does this help with local housing shortages and the badly needed replacement of dilapidated homes, but the greater efficiency of the layout results in more usable farm land in the aggregate, even if it's just a few added acres here and there. Some of the rural areas with newer housing. Here is a close-up example of the demolishing of a small village, with its older housing and more haphazard layout, and at the same time, the construction of modern houses in another village about a kilometer northeast. Unnamed village in Pyongyang that was demolished in 2017. Finally, here's a map showing many of the areas of Pyongyang that have experienced major new construction or redevelopment since 2009 (includes some industrial areas). I chose 2009 because that was the first year after Kim Jong Il's stroke and the year Kim Jong Un officially began to be groomed to take over for his father. Pyongyang, like the rest of the country, continues to grow despite sanctions or the highly unstable and wasteful model of having parallel military and domestic economies which has governed the country since the early days of Kim Il Sung. The rise of markets and an unofficial middle class means that there is more individual interest in living in nice apartments - and that there's money to go around to make construction happen. Additionally, Kim Jong Un is keen to make his mark in all areas of concern, with major construction projects being seen in every large city across the country. Kim III will undoubtedly go down in history as the man who brought North Korea's nuclear program to completion, but he will likely also be noted for spending billions on national construction; perhaps the largest builder since his grandfather. However, history will also mark whether or not all of the energy and wealth poured into these projects was worth it, or if it had no net positive effect on the people and only served to drain badly needed resources as the skyscrapers of Pyonghattan eventually collapsed one by one. hey man great pages and great picture. I'd like to use on pic as a cover for a song i'm publishing on Bandcamp called "PYONGYANG". Do you think it's possible?